T. Redies: Last spring, the NDP promised to freeze hydro rates. In November, the government announced it was delivering on its promise to freeze B.C. Hydro rates. To the Minister of Energy: will B.C. Hydro rates be frozen? Hon. M. Mungall: As you can imagine, on Thursday, when we got the report from the B.C. Utilities Commission, myself and, I’m sure, everybody on this side of the House was very disappointed to see that the B.C. Utilities Commission decided to go with what is, essentially, the B.C. Liberal rate hike rather than our proposed rate freeze. That being the case…. Of course, they gave the rationale why. What it boils down to is that we have a financial mess at B.C. Hydro. After 16 years of B.C. Liberal government, it unfortunately wasn’t that surprising. Nonetheless, we know that British Columbian households are struggling, particularly the lowest income, and that’s why we’re going to be implementing a lifeline rate. As well, this May, we’re going to be putting forward a crisis grant for people who find themselves in a medical crisis or a loss of job and it’s impacting their hydro bills. They’ll be able to apply for that crisis grant. We’re also going to move forward with the review of B.C. Hydro, because as I said, after 16 years of B.C. Liberal government, it’s time we really took a strong look at B.C. Hydro so that we can fix the mess that was left behind. T. Redies: The government announced it was delivering on its promise to freeze B.C. Hydro rates in November. According to the BCUC, the B.C. Utilities Commission, the NDP had options to freeze rates, but they chose not to. Again to the minister: will hydro rates be frozen, or has the government made an error and broken another promise? Hon. 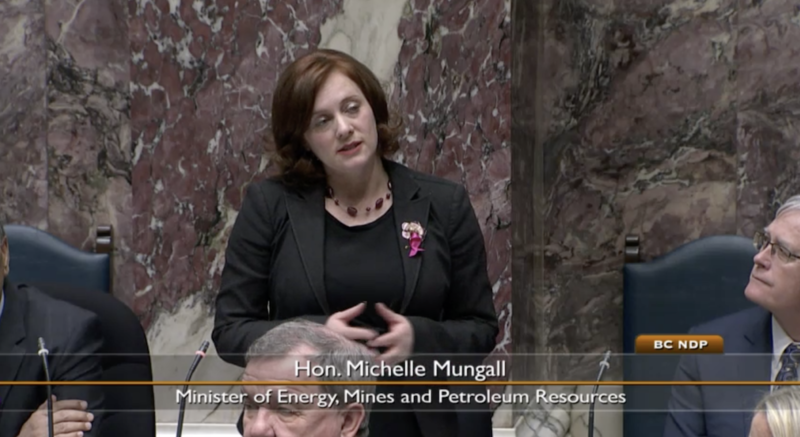 M. Mungall: What we committed to do and we were clear about is that we would make our application to the B.C. Utilities Commission, and that’s exactly what we did. Now, I know that the B.C. Liberals have problems with the B.C. Utilities Commission, and that’s why they just utterly failed to use it for 16 years. We on this side of the House respect the independence of the BCUC, and that’s why we followed the appropriate process that needed to be taken for this. Unfortunately, because of Liberal mess at B.C. Hydro, they were not able to approve our rate freeze. That being said, we have a plan to move forward with it. We plan to ensure that we’re making life more affordable for British Columbians, and we’re going to fix that mess that they left behind. Mr. Speaker: The member for Surrey–White Rock on a second supplemental. T. Redies: It’s interesting to me that the Minister of Energy keeps referring to a financial mess at B.C. Hydro, because the minister actually praised B.C. Hydro last fall, saying their finances were beating expectations and that they were on track to meet 2019 targets. The minister said: “B.C. Hydro is performing on plan. Their revenues are higher than the previous year, and they’re higher than what was originally expected.” What she couldn’t answer was how the NDP would pay for its $140 million promise of a rate freeze. So will the minister now admit that she made a mistake — over promised and under delivered? She wasn’t. Rather, she was the chair of the finance and audit committee at B.C. Hydro. She was on the board at B.C. Hydro. So if anybody needs to explain what’s been going on at B.C. Hydro and the financial mess that the BCUC has now uncovered, it’s that member right there. M. Bernier: British Columbians were told by this NDP government that rates were frozen, and people planned accordingly. I have in front of me just one of the many advertisements from last fall that reads: “We are freezing hydro rates until April 2019.” No mention — anywhere, in any of those — of the utilities commission. So will the minister admit that this was wrong and just advertise a correction? They utterly failed to do that. In fact, what they did, over and over again, is direct BCUC on everything that it should do, rather than let BCUC be that independent regulator that works in the public interest. That’s what we did on this side of House. That’s what we committed to do for British Columbians and we will continue to respect the independence at the BCUC. Mr. Speaker: The member for Peace River South on a supplemental. M. Bernier: Well, what’s failing is the minister is to answer a basic question. The hydro freeze was in the NDP platform. It was in, and is in, the minister’s mandate letter. A government news release boasted that they had actually delivered on their promise. They even advertised this as done. It was even in a newsletter last fall from the minister to residents in Nelson-Creston, under the headline, “Freezing B.C. Hydro Rates.” Again, no mention in any of these documents of the utilities commission. Will the minister at least admit that she misled the people in her own riding and her next newsletter will issue the correction? Hon. M. Mungall: I appreciate that the members opposite are struggling with the whole concept of the BCUC and the appropriate process to undertake and why they’re perplexed why we would do such a thing because they never did it themselves. But we did. We did the right process. We did exactly what we committed to doing. What we found out from the BCUC is that they’re not able to go with our request for a rate freeze. Rather they had to go with the B.C. Liberal request for a rate hike because the B.C. Liberals committed billions of dollars in high-priced, independent power producer contracts. They increased the deferral accounts from just $116 million to what is now close to $6 billion. That’s the financial mess that the B.C. Liberals left behind at B.C. Hydro. We’re the ones who are going to have to clean it up. We will do that, and we will also make sure that life is affordable for British Columbians with solutions like a lifeline rate and the crisis grant. Because on this side of the House, we actually care about British Columbians, and we actually care about helping them. I’m always left dumbfounded that politicians apparently can’t understand the concept of debt. And their understanding flips, depending on which side of the legislature has their assigned seat. How many could run their family businesses the way they’ve run the Province’s businesses and remain solvent? The kicker is, many of them claim to have been successful business people before entering politics, so there’s really NO EXCUSE!! !